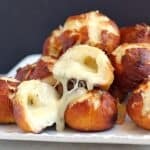 Garlic Cheese-Stuffed Pretzel Bread Bombs are fun bits of homemade pretzel bread dough stuffed with gooey garlic cheese. ​Finally! After almost a month hiatus getting​​ this site squared away with new hosting, layout, plug-ins, and my first ever logo (the logo took multiple designers and iterations and I was uber picky …I’m sure you understand​​), we are UP!! 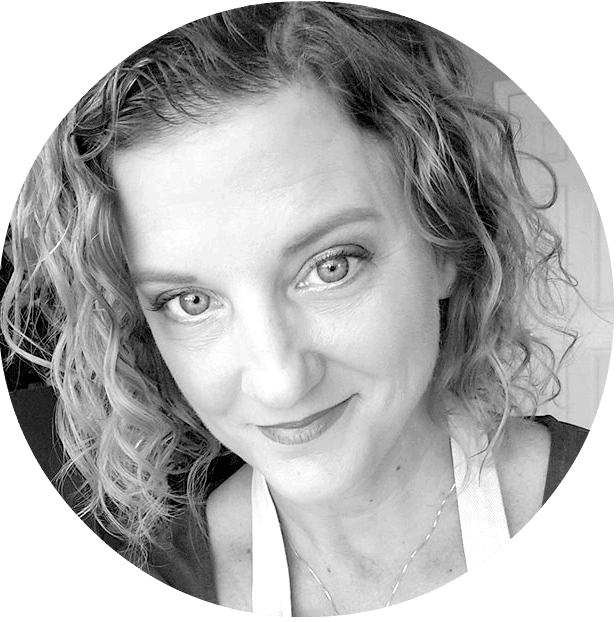 So WELCOME to the new and improved Erica’s Recipes!​​ Big thank to my IT Department (my husband Joe) for making this happen. And be sure to check out the new Full Recipe Index for a complete listing of our almost 400 recipes! Over the past couple weeks, I have created over a dozen delicious new recipes which I will ration out to you over the coming weeks. But let’s start with the one I am most excited about …Garlic Cheese-Stuffed Pretzel Bread Bombs! Let’s say it again, Garlic Cheese-Stuffed Pretzel Bread Bombs. So what was the inspiration for these cheesy balls of love? …I dunno. I probably saw a picture somewhere. But I knew I wanted my first recipe posted on my new site to be really special. And nothing says special like gooey, cheesy bread balls. ​​The fact that they’re made using homemade pretzel bread​​ should ​​scream tasty to you – homemade pretzel bread is just one of the greatest things ever. Once dough has risen, heat the oven to 400F. Half fill a large pot with water and add the baking soda. Bring to a boil. Turn the risen dough onto a lightly floured board and cut into 32 pieces. Put a cube of cheese on each, and form the dough around the cheese pressing the seams very well to seal the cheese in completely. Working in batches, boil the dough balls in the poaching liquid 1 minute. Remove from the water to a greased baking sheet (make sure it’s greased or the bread will stick when it cooks). Slice a small, shallow “X” on the top of each roll with a sharp knife (be careful to not cut through to the cheese!). Add a little water to the egg to make an egg wash (~2 t). Brush dough balls with the egg wash. Sprinkle tops with sea salt. Bake 15-20 minutes at 400 or until well browned. Yields 32 bites. When these cook, cheese will leak out. This is normal and is caused by steam from the cheese. No worries - just scoop it up and go with it! It's all good. Also, I have made this with a garlic and herbed cheddar and a garlic and pesto Monterey Jack. The jack worked better since it melts more nicely anyway. Erica, these are amazing! I can’t wait to try them…thank you! Erica, the new site is gorgeous! I love it! So airy and spacious and the logo is wonderful! 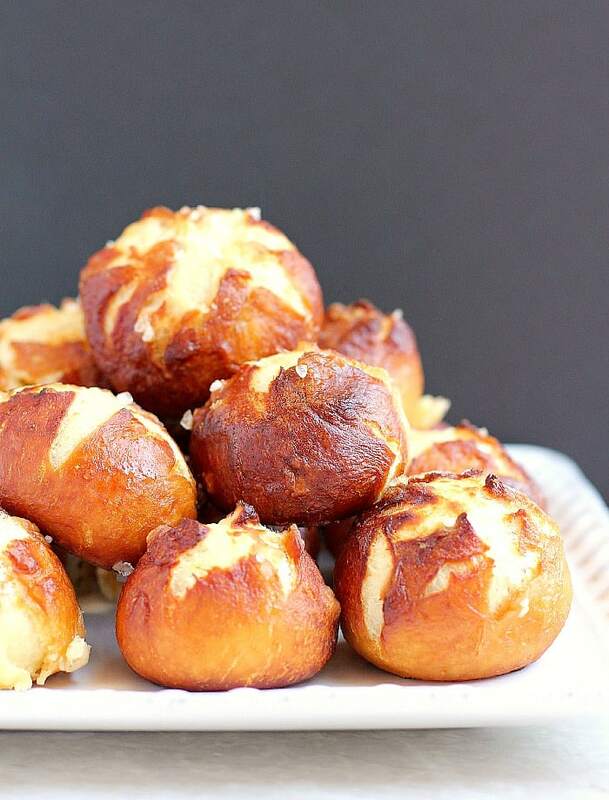 The pretzel bombs are drop-dead gorgeous! I am so excited for you! I almost licked the screen! These are Sensational!!! Cannot wait to try them! I would love to showcase them on my website, if you would consider submitting them? Congratulations on your new site Erica!!! 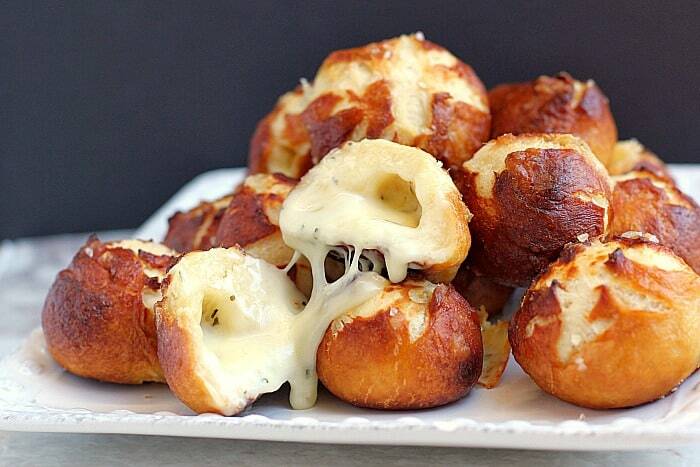 These pretzel bombs look fantastic! G’day! These look terrific Erika and I can almost smell them from here! YUM! Pinned and shared the love today too! Erica, the site looks AMAZING!! Fantastic job! Erica, these look absolutely WUNDERBAR! Congrats on your gorgeous looking new site. I wish you continued success! These are fantastic, I will be sharing them to death!! Oh Erica! These pretzels look amazing! I’m going to attempt to make them. YUM! Yum! These look so delicious. Thank you for linking up at The Wednesday Round Up! We hope to see you back next week! wow wow wow! I am glad I’ve visited your blog and found out that these bites are not fried. Fried food put me off… (even though I know it tastes great, just too heavy for me). Love love love this recipe, I will prepare these bombs for a coming soon party . Looks so yummy! Pinned this. Thanks for sharing, Erica. Visiting from Wine’d Down Wednesday. These look so yummy! Thanks for coming by and sharing this recipe at our Weekend Social on KitchenDreaming.com… I hope to see you again next week! These are “THE BOMB” !! Oh yes, you rocked them!! PS Thanks for sharing at Freedom Fridays With All My Bloggy Friends!! Hi Erica. How much baking soda do you put in the water? I am a mom of 4 and we are constantly on the go. So I really am looking for something fast and easy to make. So if you could get back to me and let me know, and if you would like to throw a couple good fast and easy recipes my way, that would be great! 😉 thanks again so much! OK, so first and foremost: New reader! And the website looks AMAZING! Nice work to you and your IT department hubby for making this work! Secondly, this dish is gorgeous… and I’m fairly positive I need to have it for a basketball game viewing sometime in the near future because OH MY GOODNESS pretzels and cheese. Thirdly, thanks for stopping by the That’s Fresh Friday Link-Up last week! This was one of my favorites shared, and I’m sharing it on my blog this evening in my personal list of faves from last week. 🙂 Thanks, again, and happy cooking! I keep coming back to these! They look so amazing Erica! These look incredible! Definitely pinning them – I’d love to try them! I have a feeling they will go really fast…I’m thinking a double batch might be smart! Every time I see this photo or recipe, it stops me dead in my tracks. Every. Time. I could eat the whole plate! Love this idea! Wanted to make some snacks for eating while watching football or basketball, even golf! These will be a great addition to my growing list of options. I’m making them fir my niece and her husband when they watch sports. Thought they would enjoy the free goodies and since I don’t gave davle, may get me invited to watch along with them (lol)! Hello! Ive made these twice now and theyre delicious!! The double batch i made for my co-workers was gone in minutes. I used jalapeno havarti for the cheese. However most of mine exploded as they baked. At first I thought I just wasn’t sealing them properly around the cheese but when i carefully did it the second time around they still burst. They seem to break on the sides and spill the cheese out. Do you think this is due to the cheese choice or something im doing wrong? Thanks for sharing this recipe! If I want to take these somewhere, do I reheat them? Or even if they are pre-made to save time. That cheese is awesome! I need to make these pronto! Sorry but what is 1c baking soda please surely not a cup ? Those look really good. I bake a lot of sourdough from like 8 different cultures. I can’t see any reason I couldn’t whip up a low hydration sourdough and bake the bombs from that, do you? Where can I find this garlic cheese you speak of?